You are here: Home › Our Blog › Business › Is ISO Registration Still Relevant? Achieving and maintaining ISO registration isn’t easy or cheap. So it’s only natural that companies might occasionally wonder whether it continues to be relevant, or more to the point, a justifiable expense. In this article, we’ll argue that, while interest in ISO certification does not appear to be growing, it has mostly remained consistent over a the past 5-7 years. with a very gradual decline over that time. The chart below shows the change in certificates for various popular certifications from 2010 – 2011. While ISO 9001 saw a slight decline as indicated above, several other standards showed significant growth in number of certificates issued. Viewed from a different perspective, how much interest was there in ISO certification based on Google searches? 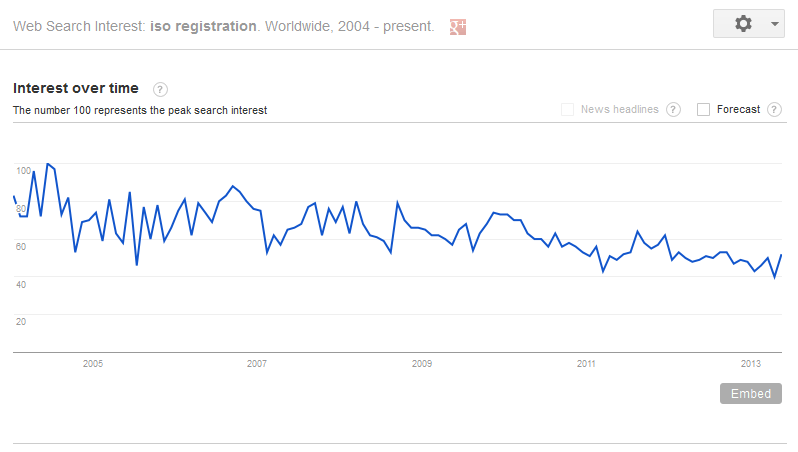 A quick visit to Google trends shows that interest in “ISO Registration” has fluctuated over time with a slight decline in interest from 2005 to 2013. Today, over 1,000,000 ISO 9001 certificates are outstanding, worldwide. From these numbers, we can clearly see that although interest in ISO registration may not be enjoying robust growth of late, it isn’t going way any time soon. Further, ISO standards are vital in certain industries to maintain the safety of consumers and likely will be for many years to come. If your company is not required by your suppliers to be ISO registered, you may nevertheless find that having that certificate is a lot like having a college degree. It’s a fundamental accomplishment that while not required could limit opportunity for those who don’t have it. For companies that are ISO Registered, promoting your registration is key to getting a return on your investment. That’s why we offer a complete range of ISO compliant products like flags, banners and logos to help you market your registration. 3 Responses to Is ISO Registration Still Relevant? The relevance of ISO 9001 Certification is still as high as it always was. Perhaps more so. The data presented in the post is simply indicating a mature market for ISO 9001 vs other standards. ISO 9001 was first released in 1987. This makes it the oldest standard and explains its maturity. The fact remains that implementing ISO 9001 remains the minimal benchmark for objectively demonstrating that your company has sound business management processes in place. The fundamental requirement for ISO compliance is documentation. I agree with Kirill about the maturation of the ISO market. But the evolution of the Web and its ancillary tools for manufacturers (ERP, indigenous intra- and extra-nets, conforming to industry/customer requirements via security & network use) are also contributing to the saturation of companies that are nearer to ISO organically. The short answer – ISO’s still relevant. Period. While developing software or building a company that works with technology or engineering-related projects, it might be worthwhile for you to apply for ISO Certification.